Matthew 18 [2.] Jesus called a little child to himself, and set him in the middle of them, and said, “Most certainly I tell you, unless you turn, and become as little children, you will in no way enter into the Kingdom of Heaven. 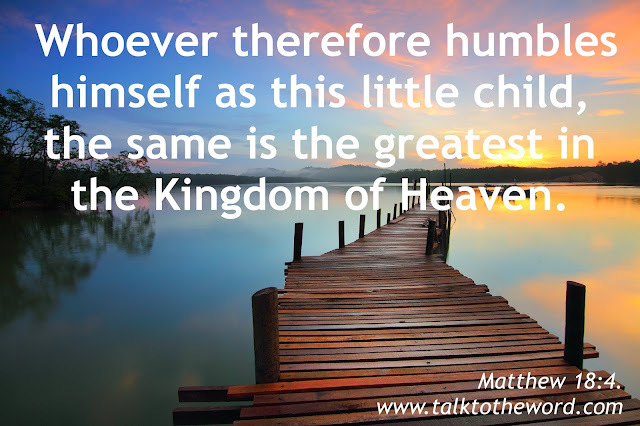 Whoever therefore humbles himself as this little child, the same is the greatest in the Kingdom of Heaven. Whoever receives one such little child in my name receives me, but whoever causes one of these little ones who believe in me to stumble, it would be better for him that a huge millstone should be hung around his neck, and that he should be sunk in the depths of the sea.